Woo-hoo! So excited rhubarb is finally ready in Minnesota. It was later this year than last, because of all the snow we had in April. My Dad gave me some last weekend and I knew I had to use it right away! 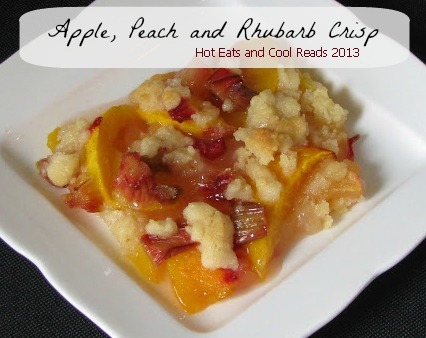 This crisp recipe originally came from my Mom and she always used it with apples. I've made it a few different ways using different fruits, and it always turns out so good with rhubarb. The fruit combo of apple, peach and rhubarb is pretty incredible! It was gone in no time at all. We loved it! Enjoy!! Preheat oven to 350 degrees. Grease a 9x13 glass baking dish. Place fruit in the baking dish and cover evenly with sugar. In a bowl, combine cinnamon, flour, sugar and butter with your fingers until mixed. Evenly sprinkle crisp topping over fruit. Bake for 30-45 minutes or until the crisp is lightly browned. This recipe was shared at these fabulous blogs! Wow! This looks awesome! I just found you over at The Mandatory Mooch! I would love for your to come share your recipe at From the Farm Blog Hop. This week's party just started! Hi and happy Memorial Day. Thanks for sharing this wonderful dessert recipe. I would love to try this sometime. You're welcome, Julie! We loved this recipe! Love rhubarb! I need to be on the lookout for it! This sounds great.